Casper's mattress lineup includes the Essential, their inexpensive entry-level product. But does bare-bones pricing mean bare-bones comfort? Read our in-depth review to find out. Obsessively engineered for outrageous comfort, our mattresses, sheets, and pillow work together to create a sleep environment that loves you back. Early in our research, we learned there are four key factors that affect sleep quality: comfort, support, temperature, and durability. Not only did our mattresses have to be soft and cushy, they needed to provide excellent support and stay cool through the night. And, of course, they needed to last. We've spent many months visiting numerous factories in order to test and understand the properties of different foam samples. No wonder Casper mattresses have won so many awards. 100 night trial. Free returns. Sleep on it, lounge on it, dream on it — in your home for 100 nights. We offer free delivery to your door in the US and Canada — and same-day White Glove Delivery in NYC, SF, and LA. If you don’t love it, we’ll pick it up from you for free, and give you a full refund. No springs attached. 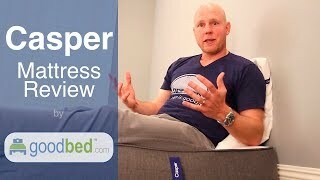 Watch GoodBed's in-depth review of the original Casper mattress, along with our short updated review of the most recent Casper Original changes, or read our in-depth expert review of The Original Casper Mattress. 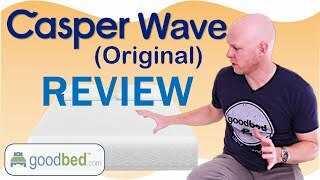 Watch GoodBed's in-depth review of the Casper Wave mattress, and our video update of the latest version of the Casper Wave, or read our in depth expert review on the Wave. 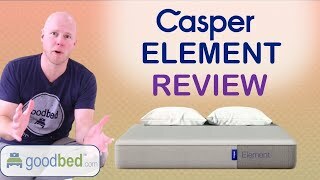 Watch GoodBed's in-depth review of the Casper Essential mattress, or read our in-depth expert report on the Essential. Based on 1,445 real owner experiences with this brand. How do people like you rate their Casper mattress? Mattresses are personal. Filter the 1,445 Casper ratings by sleep position, weight, age, gender and more to find the ones that are most relevant for you. Casper mattresses are recommended by 74% of owners on GoodBed (based on 1,445 ratings + 237 reviews). Want more reviews from Casper mattress owners? Do you have something to say about your Casper mattress? Write a Review! Cover Materials: Premium textiles from the USA and Belgium. Breathable and flexible, they are hand-sewn together in South Carolina and Illinois. Latex Details: 1.5" of continuously poured 3.3 lb Dunlop latex foam balances a 13 ILD load-deflection with an energetic springiness. Memory Foam Details: 1.5" of 4.0 lb density memory foam further relieves pressure. Foam Core Details: 7" of 1.8 lb density base foam to provide resilience and long lasting support. Warranty Details: 10 year full replacement limited warranty. Full non-prorated replacement (excluding shipping costs) for 10 years in case of manufacturing defect. Warranty Summary: 10 year full replacement limited warranty. Full non-prorated replacement (excluding shipping costs) for 10 years in case of manufacturing defect. Mattress Thickness: 8.50" to 11.50"
10 year full replacement limited warranty. Full non-prorated replacement (excluding shipping costs) for 10 years in case of manufacturing defect. Note: The product line specifications above were derived from the active Casper models listed on GoodBed. As a result, these details may not be comprehensive and may not apply to all Casper models. If you are seeking specifications for a particular Casper mattress, please search for that mattress by name on GoodBed, or check with your local Casper dealer. Which mattress from Casper is best for you? Before shopping at Casper, take a short quiz to find which of their mattresses best matches your unique needs and preferences. Powered by GoodBed’s intelligent matching technology, you can even get your personal match score for each of Casper's available mattresses, in addition to other online options that match your criteria. Better sleep for brighter days. Casper is a mattress manufacturer founded in 2013 that is based in New York, NY in the United States. Have an update or correction to our information about Casper? If so, please take a moment to suggest an edit. Casper mattresses sold by Casper come with a 100-night in-home trial. 100 day trial period with free returns, including in-home pickup from Casper. No return or exchange fees. Casper mattresses are only available online.